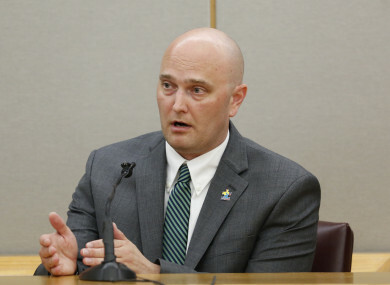 A TEXAS JURY found a white police officer guilty of murder yesterday for the shooting death of a 15-year-old African American boy – a rare conviction resulting from a high-profile police shooting case. Roy Oliver fired five bullets into a car full of teens last year, killing Jordan Edwards while responding to a call of underage drinking at a party in a Dallas suburb. The unarmed Edwards and four others were leaving the party after hearing gunfire, which had come from another nearby location. Oliver fired a rifle into the car, hitting the teen in the head. The trial jury also found the officer, who was reportedly fired from his job, not guilty of two aggravated assault charges. Oliver could face between five to 99 years in prison for the murder conviction. Tearful family members could be seen embracing during a court recess after the verdict was read. “I’m happy, very happy. It’s been a long time,” the slain teen’s father Odell Edwards told assembled news media. The trial resumed shortly after with the sentencing phase. The jury had deliberated for just two days before returning the rare conviction of a police officer in a high-profile shooting. Similar convictions in other cases have proven mostly elusive, illustrating the difficulty of convicting officers in deadly encounters where split-second decisions are made. Edwards family attorney Daryl Washington said the case was “about every African American, unarmed African American, who has been killed and who has not gotten justice”. Police originally said Oliver opened fire because the car was backing up aggressively toward him, but the department changed its account after viewing bodycam footage, saying the car was driving away when Edwards was shot. At trial, Oliver testified that he fired because the car was driving toward his partner. But Oliver’s partner Tyler Gross testified at trial that he had not felt in danger, according to US media reports. The Dallas County Sheriff’s Office said in a statement announcing Oliver’s arrest warrant last year that evidence suggested the police officer “intended to cause serious bodily injury”. The shooting was among a growing list of similar cases in which African Americans were killed by white police officers. The high-profile incidents, often accompanied by official or eyewitness video footage, have fueled outrage across the United States and given rise to the Black Lives Matter movement. Oliver was the first on-duty Texas officer in more than 40 years to be convicted in a shooting death, according to the Fort Worth Star-Telegram. The Texas chapter of the American Civil Liberties Union hailed the conviction for sending “a powerful message”. “There is a long history in this country of failing to hold law enforcement responsible for even the gravest abuses of power,” the group’s Sharon Watkins Jones said in a statement. Email “Texas police officer found guilty of murdering unarmed black teenager”. Feedback on “Texas police officer found guilty of murdering unarmed black teenager”.